Studies have found that 62 percent of dogs between the ages of 11 and 16 have at least some symptoms of Cognitive Dysfunction Syndrome (CDS). Sometimes called Doggie Alzheimer's, the symptoms of canine CDS are similar to those of human Alzheimer's patients: disorientation, confusion, memory loss, and changes in personality. Thankfully, there is hope. 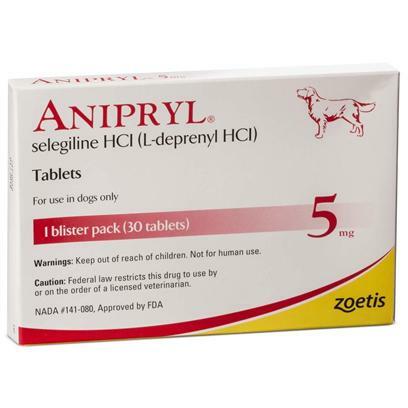 Anipryl is an oral tablet that is highly effective in treating canine CDS. It works by boosting the dopamine levels in the brain. In fact, 70 percent of dogs with Canine CDS responded positively after a month of treatment. Anipryl is also used to treat conditions caused by an over-secreting pituitary gland. Anipryl works by suppressing the pituitary gland directly. This is a new and innovative approach in treating such conditions. It may take anywhere from one to three months of treatment before any positive results show. It is easy to administer and does not require monitoring, since it does not inhibit the adrenal gland's function and will not cause adrenal toxicity or insufficiency. It can be given with food and is available in multiple dosage sizes. A generic alternative to Anipryl isSelegiline. The most common side effects are mostly mild to moderate vomiting, diarrhea, diminished hearing, disorientation, loss of appetite, and hyperactivity, restlessness or other behavioral changes. For treating Cushing’s disease: An oral dose once a day for a two-month period; the dosage can be doubled for one month following this if the pet shows no response to the smaller amount. For treating CDS: A smaller oral dose once a day for a one-month period; if there is no improvement, the dose may be doubled for one month. Beyond that, a veterinarian should be consulted to discover if another underlying problem is causing the dog’s symptoms.